Just looking around various boat related things. A very good idea to have even if you are not single handing. You don't appreciate how difficult it is to get someone out of the cut until you have to do it. If you are a cheapskate 😜, you can make your own. Here is a picture of the ladder at the end of my mooring jetty. Made from 40mm diameter plastic waste water pipe, drilled through each end and rope threaded through and knotted below each rung. The pipe is easily strong enough to take a persons weight, provided the rung is not too long. It could easily be turned in to a boat rescue ladder by rolling it up and tying a bit of cord around it with a bow and a long tail to release. Attach to a dolly, or other strong point of the boat, within reach of the water. Worth adding a weight to the end to ensure the rungs sink quickly if it has been deployed in an emergency. Rope ladders of this type and the sort that @Alan de Enfield links to are harder to climb than people think. Worth practicing in a safe place before you have to do it for real. It is a Rib/rubber dingy folding boarding ladder with two rugs repositioned so it will fold flat. I can be reached and removed by someone in the water and the rope hung over a T stud or dolly etc. It will also unfold and stand against piling or when the other way up fold to allow it to conform to a muddy mbank profile to allow you to climb out. For those that don't know the secret to climbing a rope ladder is to climb it from the side, i.e. 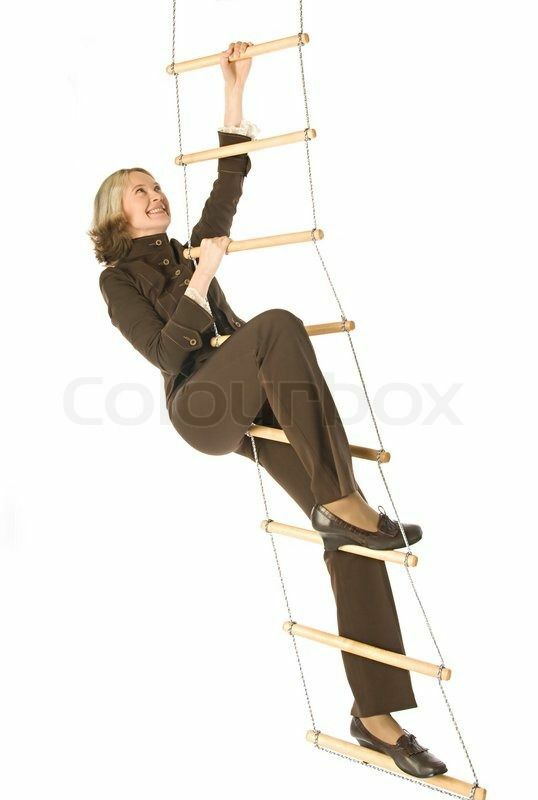 with one rope between your legs and using the front and back of the ladder for your feet. Then it doesn't swing away from you. Oh yes it does - have you tried it yourself? Last summer we gave it a try and found the ladder still swung away causing most of the victims weight to be taken by the arms. Still working on a solution, but I believe that a proper ladder is the only practical option if trying to get back onto the boat. 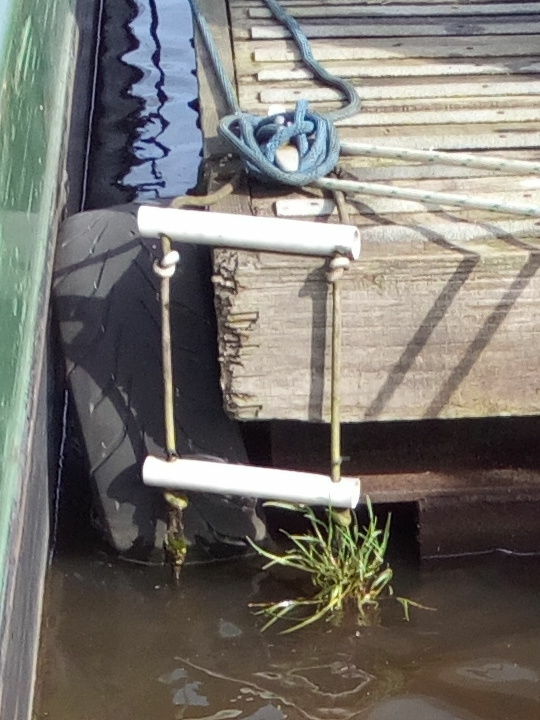 The rope ladder worked OK against the river bank (hanging from a mooring pin) as the bank prevented ones feet from swinging away from under you. We also used the rope ladder in a real MOB rescue from a canal - even that was touch and go due to the victim being exhausted by the time we got involved. Yes often, in my youth I used to climb 25ft up to lighting trusses as part of my job. Hated it but had to do it to fix stuff. And when your thigh gets level with the hull the ladder tries to trap is between itself and the hull. Even my rigid ladder tries to swing away from you if at least part of it is not resting against something solid. I tried it hooked of jetty mooring eye and it was pretty much impossible to use. Fine when hung from the T stud. I fitted one of these a few years ago. I added an old diving ankle weight under the bottom step to help it fall better. Ive jumped overboard and tried it out a few times when I fitted it to see how easy it is to deploy. Flexible ladders definitely need practice with in a safe place before being used for real. I go caving and we used to use very narrow wire ladders with aluminium rungs for getting down and up vertical sections. 6" long aluminium rungs on 1/8" wire sides at 10, or 12" spacing. People used to do climbs of hundreds of feet, often free hanging. I've only done a maximum of 90' climb on one and am very glad they are no longer used much and then only for short drops. Now largely replaced with more modern methods, but there is a definite technique that had to be learned to prevent you hanging on your arms. For novices, or the less agile, then a fixed side ladder is much better. I used to have one, but it was stolen from my boat. And perhaps compounded by an injury. 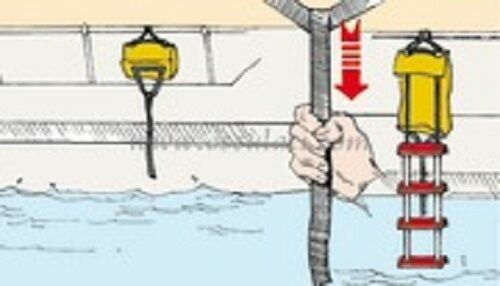 I can see how suspending the ladder forward of the swim would provide a deeper amount of hull below the water to help stop the ladder swinging away from you. In this case better not to climb sideways. My failed experiment was from the aft deck so above the swim. These are exactly the ladders we used, hateful things. I used to have quite a seriously bad back and one excellent use I found for the ladders was as a place to hang whilst wearing my gravity boots helped my back immensely.